Dr. Bello Lawal Danbatta, Secretary-General, Islamic Financial Services Board (IFSB) and Mr. David Walker, Secretary-General, International Association of Deposit Insurers (IADI) signed an MoU today (6 August 2018). Dr. Ronald Rulindo, Chief Specialist, Indonesia Deposit Insurance Corporation (IDIC) as well as Mr. Rafiz Azuan Abdullah, Chief Executive Officer, Malaysia Deposit Insurance Corporation were also present to witness the signing ceremony. 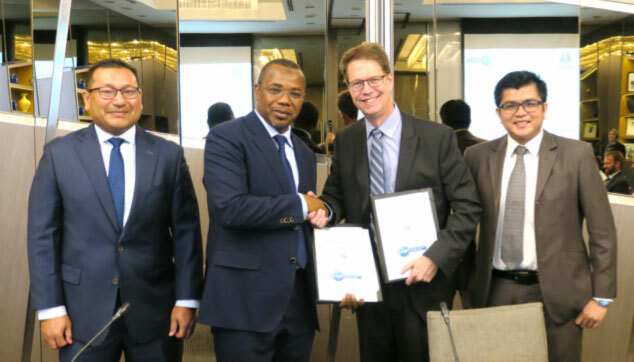 17 August 2018, Kuala Lumpur, Malaysia – The International Association of Deposit Insurers (IADI), represented by Mr. David Walker, Secretary General, and the Islamic Financial Services Board (IFSB), represented by Dr. Bello Lawal Danbatta, Secretary-General, have signed a Memorandum of Understanding (MoU) on 6 August 2018 in Kuala Lumpur, Malaysia. Collaborate to jointly develop the IADI-IFSB Core Principles for Islamic Finance Regulation: Effective Islamic Deposit Insurance Systems (CPIFR-IDIS), with the aim of providing guidance on the matter specifically to the members of both organisations, and the deposit insurance sector in general. Collaboration under this area can include organising joint workshops and programmes, and providing expertise for joint technical assistance missions. In addition, facilitating coordinated policy dialogues to regulatory and supervisory authorities in the member jurisdictions of the two organisations. Awareness raising through knowledge sharing and organisation of executive programmes, workshops, seminars, etc. To promote the exchange of information and knowledge-sharing to benefit from each organisation's experiences and expertise, to the greatest extent permissible. Also, to enhance outreach to member jurisdictions for building awareness through joint organising and hosting of international conferences, seminars and forums on areas of mutual interest. The IADI-IFSB MoU signing ceremony took place during the inaugural Joint Working Group (JWG) Meeting of the CPIFR – IDIS on 6 August 2018 in Kuala Lumpur, Malaysia. The JWG is guiding the development of CPIFR-IDIS, which aims to serve as an internationally recognised framework to facilitate the development and implementation of effective Sharīʻah-compliant deposit insurance systems (SCDIS). The Islamic Core Principles will enable deposit insurance providers to identify gaps in their existing deposit insurance practices, while also setting an international standard-setting benchmark to facilitate independent (or third-party) assessment on the effectiveness of SCDIS. The joint standard will complement the revised Core Principles by the IADI for the conventional deposit insurance systems, upon which they will be based.